Raking leaves and clearing branches can be back-breaking work. What if you could blow all that debris away, vacuum it up, and quickly mulch it with just one tool? Black & Decker has the solution for you. 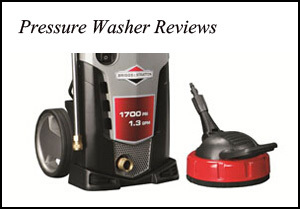 These two hand-held electric blower/vacuums are versatile and powerful. Let’s look at them both and see which one will be best for you. If you want to vacuum debris, it only takes a few seconds to pull off the blower tube and pop on the vacuum tube and collector bag. No tools are needed. The BV5600 automatically mulches as it vacuums, grinding leaves and grass clippings into smaller bits. The collector bag can hold up to 1.5 bushels, or about 20 pounds of grass. Since the BV5600 itself weighs about 8 pounds, it gets pretty heavy while vacuuming. Black & Decker says that the suction power decreases as the bag fills, so if it’s not working as well, empty it. The body of the blower has two handles for better control. There is a cord retainer to hold the extension cord firmly in place so it doesn’t come unplugged unexpectedly. The 12Amp motor isn’t terribly noisy—just a little louder than two people talking on the street. The Black & Decker BV6600 is similar to the BV5600 above but with a few handy differences. For one, the speed selector is variable. It ranges between a relatively gentle 140mph up to the maximum of 250mph. Instead of choosing just the high or the low speed, the user raises or lowers the speed gradually by turning a dial. A second difference is in the attachments.The BV6600 comes with a narrow rake attachment for the vacuum tube, and a disposable collector bag instead of only a reusable one. The disposable bags that Black & Decker sells are made of Polyactic acid, cotton, and hemp, so they are 100% biodegradable and compostable. The third difference is the detachable shoulder strap and cushioned rear handle which make the BV6600 more comfortable to use. This blower/vacuum weighs 8.1 pounds, the same as the other described above. That means it starts getting pretty heavy while vacuuming, so the shoulder strap is a welcome addition. The bag can hold up to 1.5 bushels, or about 20 pounds of grass clippings, and it mulches while it vacuums. Black & Decker says the mulching works at a ratio of 16:1, so it fills the collector bag just once instead of needing 16 bags. If the suction seems to be getting weaker, empty the bag. The 12Amp motor runs at about 68dB(A), or a little louder than a normal conversation on the street. This is about average for leaf blowers in this class. Finally, the BV6600 has a 12Amp motor like the other model above. Black & Decker recommends using not more than 150 feet of extension cord because of the current needed to operate it. To keep the cord from coming unplugged, use the built-in cord retainer on the blower. Both of these blower/vacuums make yard work much easier for homeowners, and they are not as noisy or messy as gas-powered blowers. They need little maintenance. Choosing between these two models comes down to two criteria: air speed and accessories. The BV5600 is just the basics. It has only two speeds: high and low. There are no extra attachments or accessories beyond what it needs to operate. 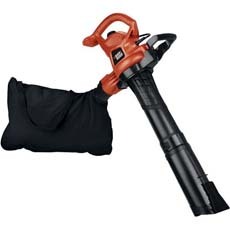 If you want a powerful hand-held blower that vacuums and mulches and you don’t need the extras, get this model. The BV6600 comes with a variable speed selector dial that ranges between 140 and 250mph. If you have flower beds and other delicate areas where you need to blow away debris, this model would be the better choice. 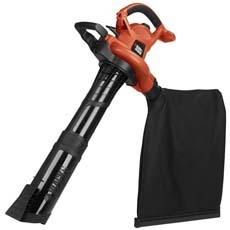 It comes with a shoulder strap for comfort and a rake attachment to make vacuuming easier. Click here to purchase Black & Decker BV5600 on Amazon! Click here to purchase Black & Decker BV6600 on Amazon!